No-churn coffee ice cream with chocolate chunks, swirled with caramel and chocolate. It has the perfect hint of coffee and ultimate rich, creamy and smooth texture with perfect sweetness. Kid’s summer breaks are fun: No matter what the weather outside is, my freezer always has plenty of ice-cream. Thanks to Ado who encourages me to make ice-cream during her summer breaks. However, I am not sure, who should thank whom here. 😉 10 more days and she will start going to her kindergarten again. Baking or cooking: The other thing which she wants me to do is — she wants to spend time in the kitchen with me. And most (99%) of the times this is for either baking some sweet stuff or an ice-cream. Yes, she insists me to make ice-cream every time our freezer is without ice-cream. Yeah! And yes, I do make some ice-cream for her. Well, I do have a couple of personal reasons for that. Me: “We, don’t have any ice-cream and it’s too late so I don’t want to buy it”. And the ice cream that I made the last time was this No-Churn Coffee Caramel Chocolate Ice-Cream. It does not need any fancy coffee. Instant coffee powder or espresso powder would do the magic. This means no beans or grinding for coffee. It is super creamy and you can scoop it out within 5 mins from the time you take it out of the freezer. It’s classic, creamy and super smooth, and rich in coffee flavor. 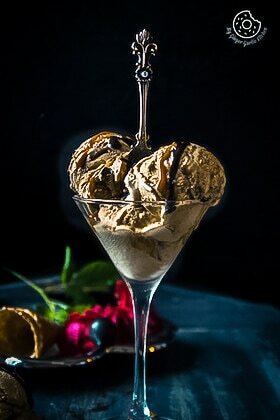 Everyone who loves to drink coffee would love this coffee ice cream, isn’t it? Everyone differs when it comes to his/her favorite coffee flavor. Some want it mild and others want it strong. Here a good thing: you can adjust the amount of coffee according to your own favorite taste! It has chocolate chunks in every bite. It has the sweetness from caramel and chocolate swirl. No ice-cream machine is needed. So what do you get at the end? You get a homemade No-churn coffee ice cream with chocolate chunks, swirled with caramel and chocolate. It has the perfect hint of coffee and ultimate rich, creamy and smooth texture with perfect sweetness. 2. Add vanilla to condensed milk and stir well. 3. Dissolve instant coffee powder in warm water and stir into condensed milk. 5. Drizzle the caramel and chocolate sauce on top and add the chocolate and fold gently. 6. Drizzle more chocolate sauce and caramel sauce. 7. Sprinkle ground almond on top. 8. Cover with cling film and place in the freezer for 6-­8 hours, or overnight. 9. Scoop out ice-cream in a cup or cone. 10. Drizzle more caramel and chocolate sauce on top and enjoy! 1. You can also add toffee bits to this ice cream. 2. Instead of caramel sauce, you can also use dulce leche for this recipe.